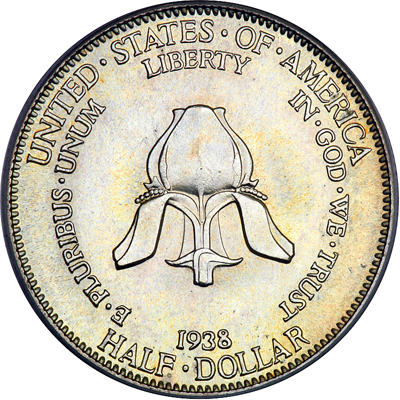 The 1938 New Rochelle half dollar is another example of a commemorative coin issue honoring a strictly local anniversary. In this case, the 250th anniversary of the settlement of New Rochelle, New York was being honored. The city was a wealthy suburb of New York City, and that wealth likely helped the sponsor of the bill, the Westchester County Coin Club, get the legislation passed. A bill signed into law on May 5th, 1936 authorized the minting of up to 25,000 coins of a single date and mintmark. Originally chosen to design the new coin was sculptor Lorrilard Wise. Unfortunately, his designs were lackluster in the eyes of the Commission of Fine Arts, and he was soon replaced by Gertrude K. Lathrop, who had experience in producing designs for coins and medals. 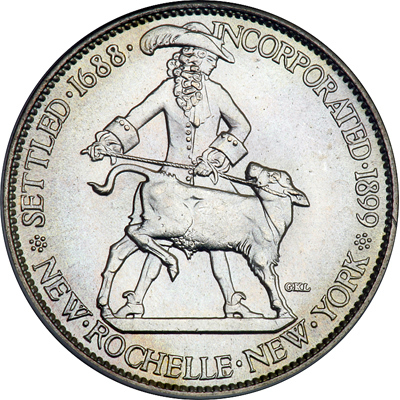 Her obverse depicts John Pell, who sold the land that would become New Rochelle to the colonists. One of the terms of that deal included a “fatt calfe” to be delivered to Lord Pell on the 4th and 20th day of June every year. 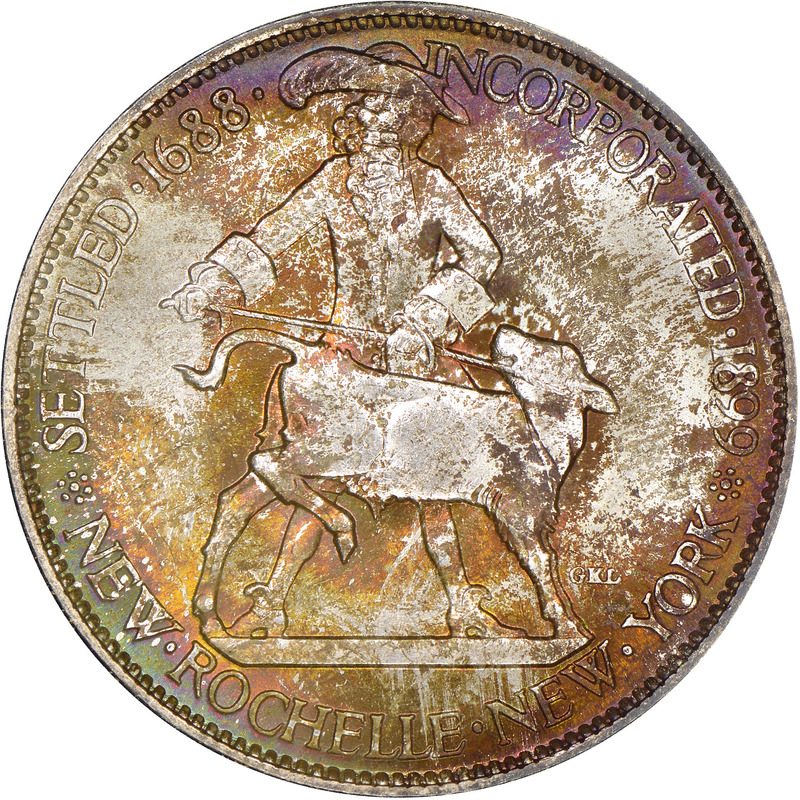 In honor of that odd request in the sale, a calf was included in the obverse design and is shown being led by Pell. Arranged in arcs around the periphery are the legends NEW • ROCHELLE • NEW • YORK and SETTLED • 1688 • INCORPORATED • 1899. The reverse design is dominated by the fleur de lis, an element from the city’s coat of arms. Arranged in arcs around the periphery are the statutory inscriptions UNITED • STATES • OF • AMERICA, E • PLURIBUS • UNUM, LIBERTY and IN • GOD • WE • TRUST. 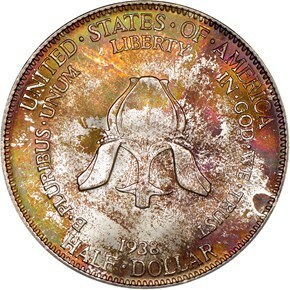 The date 1938 and value HALF • DOLLAR appear at the bottom in two lines. The entire authorized mintage of 25,000 coins was struck in April of 1937 (but with the date 1938.) The coins were sold locally for $2 each, but most went to mail orders. 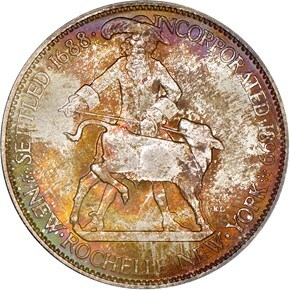 Although the speculative market for commemorative coins all but collapsed in 1937, the New Rochelle coin sold relatively well. In the end, 9,749 coins were melted, leaving a net mintage of 15,251 coins.